I grew up in a rancher similar to the one above. 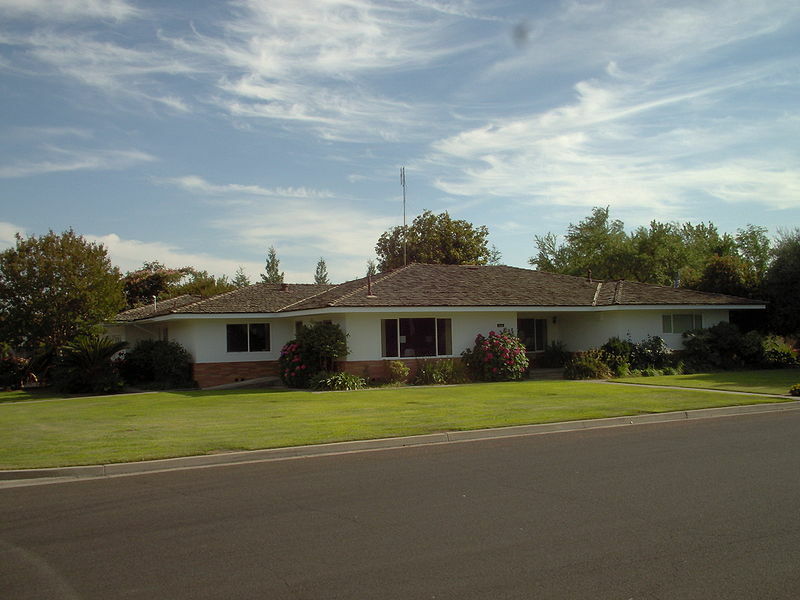 Built in the early 60's, it had everything I dislike, like metal sliding windows, sliding glass doors, formica countertops and aqua colored appliances! Who knew that I would someday want to buy a mid-century rancher and remodel it! I am so inspired by the remodel of this mid-century rancher above and below. It seems that no surface was left untouched! This is the front door and entry. That door is the same door of the house I grew up in, but with the addition of shutters, it looks really cool once again! Inside, the dining area has undergone a drastic change. 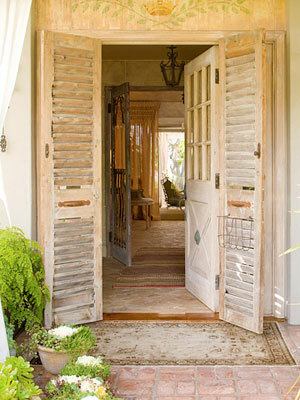 The proverbial sliding glass door has been replaced with french doors. But more importantly, the floors in this house are all brick! I think that is what really makes this house feel like a cottage and not a rancher. It probably was built on a concrete slab like a lot of homes were in the 50's and 60's. In the living room area, it looks like all the moulding has been removed in the house and the walls are Venetian plaster. The kitchen does not look anything like its former self! 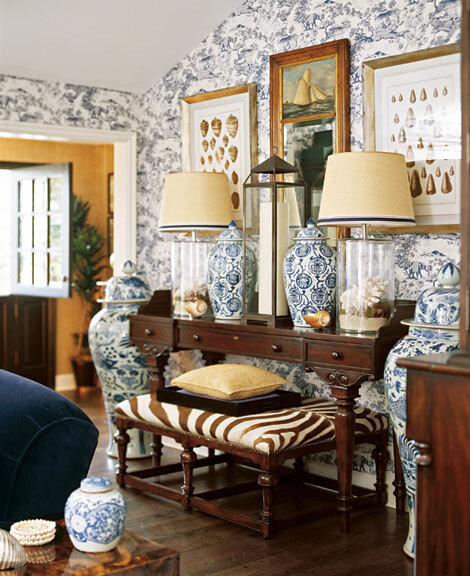 Here, the homeowner put two dressers back to back, then topped it with marble, forming an island. 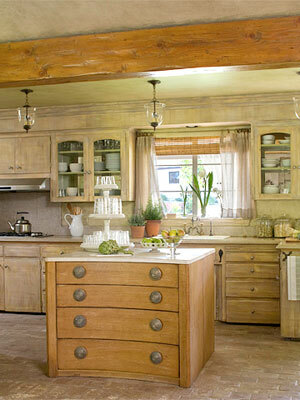 The original cabinets were finished to look like wood. The romantic master bedroom. Again, french doors replace the metal slider. This home does not feel like the home I grew up in, but rather a very romantic cottage. All on one level! Perfect for an aging baby boomer! The exterior reflects a typical rancher, but hanging outdoor curtains on the posts and updating the landscaping gives this rancher lots of romance! 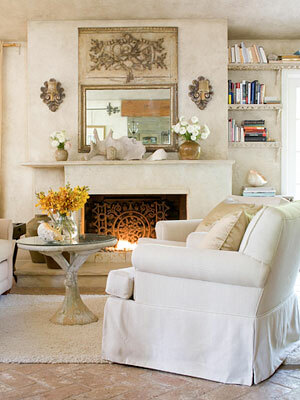 Designers have also discovered the beauty and challenge of remodeling a typical ranch house. 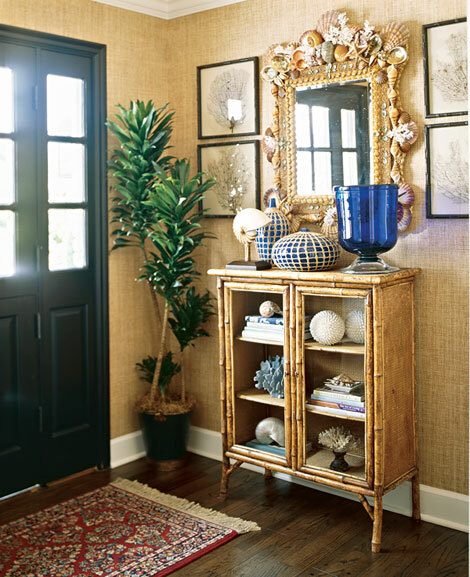 Here, Barclay Butera used grasscloth on this home's entry, setting the stage for his ranch. I love how Mr. Butera carried the grasscloth to the living room, applying it to the ceiling of all things! He put board and batten on the walls, then grasscloth above. Typically, ranch houses only have an eight and a half foot ceiling height. This idea helps alleviate that problem without raising the roof! Here, the roof is raised! Although this photo has been around awhile, and although I'm not a blue person, I love this room! This is in no way a rancher! Sisters Laura Forbes Carlin and Alison Forbes designed a chemical free home in this mid-century rancher using low VOC furniture, paint and carpeting. 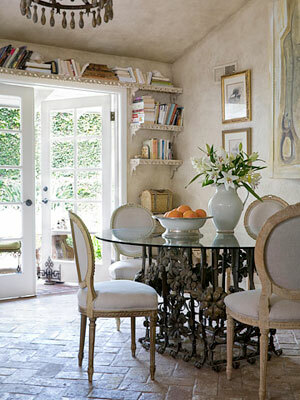 The dining room with recycled dining room table and simple and earthy decor. 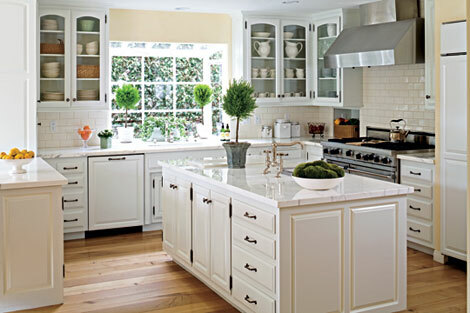 The clean, white kitchen is a long way from the kitchen I grew up with! 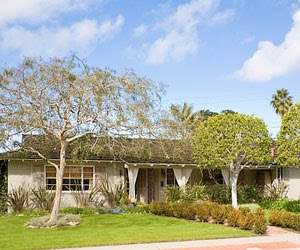 Just for fun, here is a 1952 ranch house in northern California that I was asked to stage before it hit the market. Offered for the first time since it was built, it is like walking into the past. The original dining room with its mid-century modern furniture. Do you think this rancher has possibilities? Could it become a quaint cottage? The house has a den with an original naugahyde upholstered bar! I can only imagine the martinis that were served here. This is like a set out of Mad Men! The kitchen with yellow and green tile is isolated from the rest of the house. Clearly, a wall would need to come down to make this house flow! The master bedroom is a blast from the past! The master bathroom. Can you believe the wallpaper? The best part of this house is a little alcove with its Hollywood influenced vanity. As I was staging this house with new landscaping and accessories, I kept wondering if it had possibilities. Could this home actually be a cute cottage, or was it destined to sell for lot value and be replaced by a new "faux chateau." A wonderful loggia connects the living room and bedroom to the back yard. I imagined the possibilities of this space if I could do what I wanted. A chandelier for sure would hang over the table and chairs. Luckily, there was this nice painted furniture in the basement with stripe cushions waiting to be discovered. Much of the original and over grown landscape was removed. I could imaging outdoor curtains hanging all around, framing the view to the backyard. Maybe this home doesn't have the bones necessary to make the transition to this century; I will be curious to see what the new owners end up doing with it. Our home in the wine country started out as a 70's rancher. It was added on to and a stone facade was added to part of it. 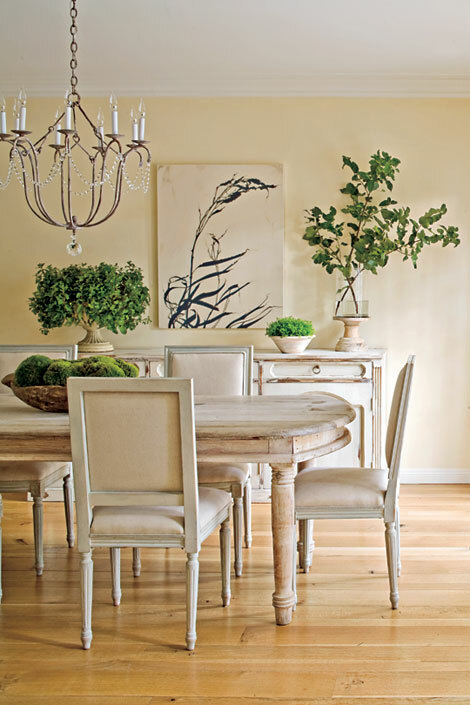 The house was built on a cement slab, so the floors were exposed and painted a pale sage green. The color of "the underside of an olive leaf!" The previous owners updated the bedrooms with engineered flooring, which looks pretty authentic and also with upholstered walls. This is a great way to cover up the typical textured sheetrock of the day. The bedrooms still have the original sliding glass doors though. The only doors not replaced in the house. The bathrooms have been updated also. Black granite counter tops with stainless steel sinks. The windows are original sliders. 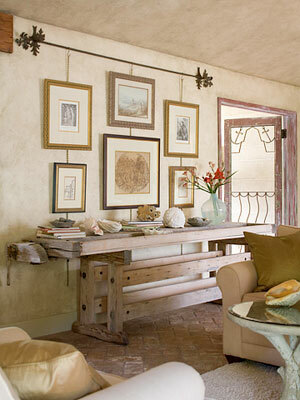 Venetian plaster walls. Black slate floors. As the baby boomers age, there will be a need for one level homes. I for one am looking forward to never climbing stairs again! The solution could very well be a 50's or 60's ranch house with really good bones, willing to be transformed into a quaint romantic cottage. I have so many ideas for such a remodel and would love to take on the project within the near future! 2. Replace any metal windows with new windows. If necessary, increase their size. 3. If possible, raise the roof in the living and/or dining room. 5. Of course, remodeling the bathrooms and kitchen is probably a must! 6. Consider the walls. Board and batten walls will hide dated finishes. 7. Get rid of the popcorn ceiling! Consider tongue and groove ceilings, or Venetian plaster. 8. Create curb appeal with new and updated landscaping. Think boxwood hedges, white topiary rose bushes, brick or stone patios, and a killer front door. 9. Replace all lighting, indoors and out. 10. Every day, be thankful that your bedroom isn't upstairs! Wee haw! Those are some seriously sassy ranches! I especially love the shutters on the front door and the outdoor curtains on the first one...frankly hard to imagine being outside at all as we have been under acres of snow for months...hello? Al Fresco, where are you? The 50s ranch looks like a time capsule or a set. Again hard for me to imagine not changing my interiors for decades. I change them with the seasons! With the exception of that mirrored vanity, how timeless. Using two dressers back to back as an island? Why didn't I think of that? Brilliant. The realtor called our 1800's single level hunting lodge a 'ranch' in the listing, my husband didn't even want to look at it at first. Thank god he saddled up and check it out. I love not having to deal with stairs. And I love this post. I could go back and lament for hours .... so much to take it. Wow that ranch is like stepping back into time or like you said a set from Mad Men. I can so see possibilities in it though. Wouldn't that dressing table look wonderful dressed up with some floor to ceiling fabric curtains to help soften the space? All the rooms can be brought into the current century. 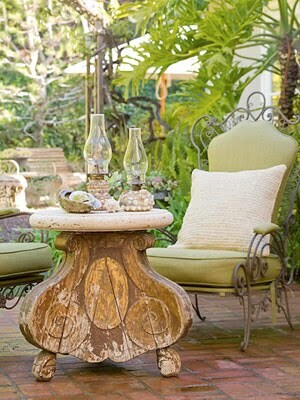 There are those who would love it just like it is with the authentic furniture too. The kitchen looks to be the most needed in work. I can see that outdoor area being enough to sell the whole house. What fun. Beautiful images especially that first house. Those brick floors are pretty but are very hard on the legs and back and cold. Love your ideas for renovating one. My husband said we are staying here until we go to the old folks home or get bought out for commercial property which could happen down the road. My house is too small to qualify as a ranch, but I had many of those challenges - oh how I loathe my one remaining popcorn ceiling! Thank you for continued inspiration! This post was delightful...oh the possibilites. I think I am in my forever home, a full cape. However, I would love to come along for the ride if you ever do it!!! Delores, if anyone could transform a rancher for this century, it is you. Wonderful ideas. It would take some work, no doubt, but if an individual has imagination and a good decorator like you, it could be a wonderful space. I've never lived in a ranch style home. Might be fun to take on the challenge. I think ranch living would be great. Plus the full basements they have out here in Chicago. Did you stage that ranch, it looks like it has so much potential. I just got my Traditional Home this month, and was disappointed, noticing, gee, I think I get more inspiration from vignette design!! This post is a perfect example of that. Thank you. This was a great post Delores. I have been in Barclay B's house. It is really wonderful. It actually isn't really near the beach but in a very "hot" neighborhood of ranchers/fixer uppers called Newport Heights with great schools and shopping. I like the idea of the single level again....works well when we are using walkers and canes! Great post! Enjoyed the tour and packed with ideas! Wow, where to start. The kitchens are all amazing but, I was totally inspired by the idea of taking two dressers and putting them back to back with a slab of granite on top. Genius. Seriously a cool idea. I loved that ranch style home you staged. It made me laugh because it was literally like looking at my grandmother's house! The bathrooms are identical! As you know...we just moved: not to a rancher, but the master bedroom is downstairs! Wonderful, wonderful. My previous house was ALL stairs; it was endless. So now I still go up one easy flight to my office (guest room is up here also), but it is heavenly having our bedroom suite downstairs. Go for it! Great post! 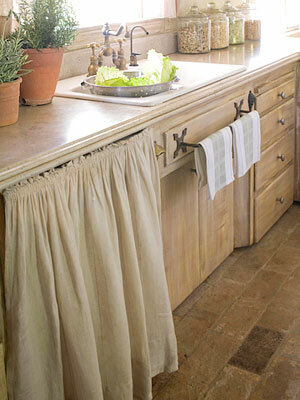 Love these ranch re-dos!That's a project I would love to take on myself. What a blast from the past! I've walked through that front door at least a million times. . .slamming it on occasion! I grew up in the KCK area in a 1960's rancher. No sliding doors, no weird tile. . .but our kitchen was painted pink. Ours had a basement, unfinished. My sister and I used to ride our bikes around the concrete pillars! My mother had the tiniest kitchen ever and no window while washing dishes by hand. We did have a huge bay window in the dining area. This was an amazing post. Thank you for allowing us to dream beyond the obvious and to envision the possibilities! Delores, I grew up in a rancher thats exterior was very similar to the last one. We have three levels in our current home and we will not do this again. I'll be looking for a rancher next time. That first ranch style home was exquisite. 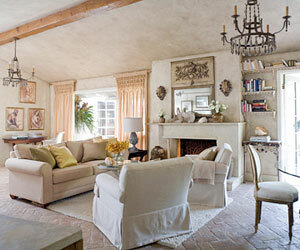 I loved all of the French details and soft colors and fabrics. We have several ranches around here that they have done exterior facelifts too in very clever ways that make them a lot more dressy. I couldn't live with the one vintage one, but it sure was in the original condition and it was like walking back in time. Oh I love a great ramblin' ranch! We are in one now....and have quite a few things left to cross off of your list! Loved this post. I live in a ranch style home. I wish they would hurry and come back in fashion...lol they do make for easy living ! My daughter just built a two-story home , it is beautiful, but living there 20 plus hours per week to take care of Tate has proven once again, I love my rancher. I would not trade ! lovely post. so many inspirational pics! Wow, those examples of what you don't like are all in my mother's home! She has a late 50's rancher on a slab. We used to have the turquoise kitchen, she updated to coppertone in the late 70's then white in the 90's. The pink and gray tiled bathroom is still in tact but it has the metallic wallpaper like your one picture shows! The tiny kitchen in Mom's home is the biggest disappointment. One thing for sure is- it was well built! She did replace her slider set with a french door unit, but french doors eat up a lot of space for opening the door. Your examples of how to make one look and feel different are quite wonderful. I love this post! I am so ready to do a remodel! 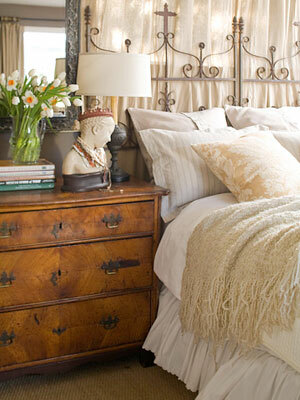 WOW is all I can say...love the two dressers turned island,great post! Thanks! This is an incredible post. It is so chock full of ideas and imagination. I'd love to see what the house looked like AFTER you stagged it! As far as the "after" photos for the house I staged, we decided to keep the original furniture and just bring in accessories like plants, flowers, pillows and throws to warm it up. The wall to wall carpeting was pulled up, the drapes were removed and the interior was painted. The landscaping was important as it was overgrown and hiding the house entirely! What good Pics for ranchers are posted here in your blog.Those are really impressive. Hey Delores, I just read this post for the second time and was wondering, what ever became of this house? Did it sell, what did the new owners do with it. It really was like walking back in time. Lots of retro furnishing that someone would have been thrilled to find for sale.